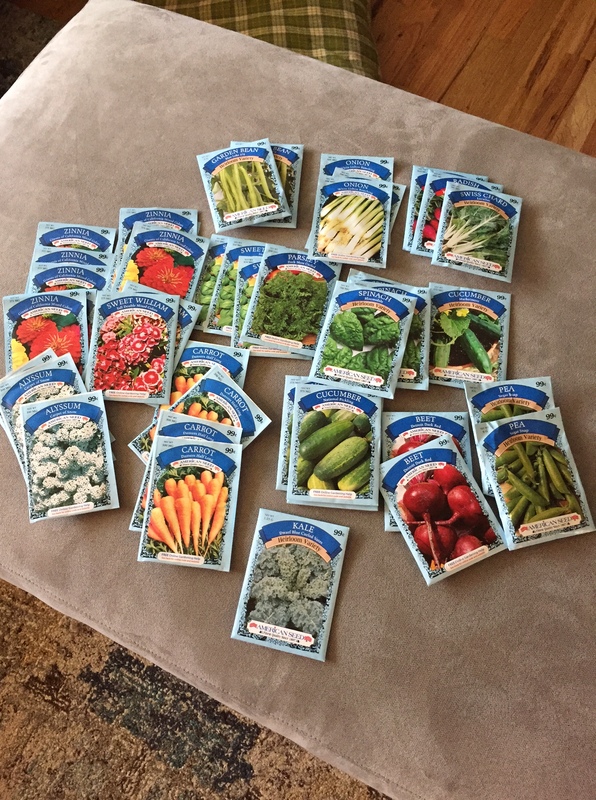 I got some seeds at the $ Store for 4/$1. I also made out my order for Territorial Seed Company. I love the Territorial seeds for my main crops, and things I care about certain varieties for. I love the inexpensive seeds for tucking in corners, planting early, and food I don’t like very much, like kale. (I think Lovana likes kale now, so I’m growing it for her, but she won’t eat much–Rob won’t eat any) This huge pile cost a little over $10. You don’t get very many seeds in each packet, but I’m not thinking that’s going to be a huge problem with things like kale. With zinnias, I’ve used these seeds many times and just plant several packets wherever I want the flowers. I cleaned my fridge. It was awful. Then, I made a menu plan for the upcoming week based on what I found inside, freezer items, home-canning, and the small grocery list I formed. Rob was given several items from a friend who is cleaning out some large sheds/shops. He accepted napkins, tissues, craft supplies (not sure exactly what), some t.p. to donate and some seltzer water. There may be more, I haven’t looked at it all, yet. He went and got wood from my sister’s farm. He figures we have enough stored up there for another year, but we will need to chop some wood this summer to dry for the future. I cooked quite a few items for meals, but mostly used the rest of the food from last week. This coming week, I will need to cook more, but I have a good plan. 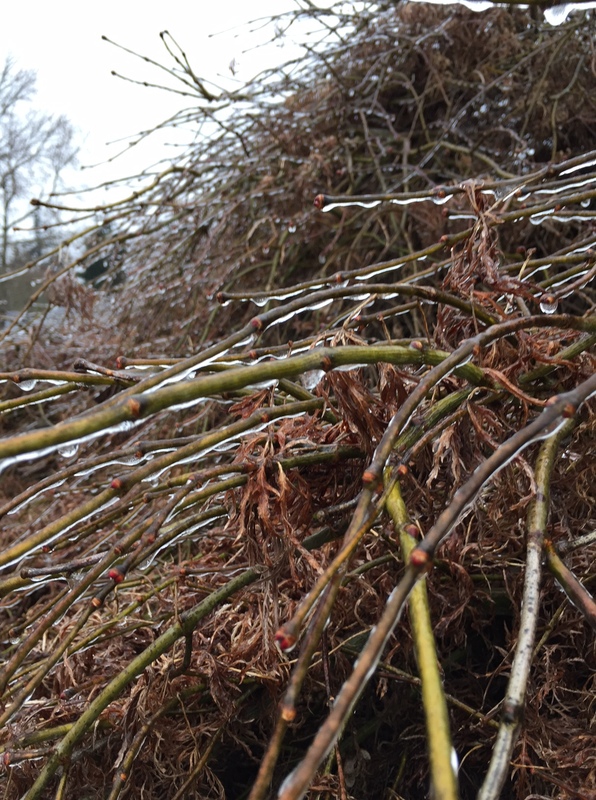 Thankfully the ice has melted and it’s been pretty springlike the past few days. Most of my week was full of homeschool, work, and some extra cleaning I got done. It was a very productive week. Previous PostTime To Clean the Fridge and Menu PlanNext PostWhere Do I Purchase My Seeds? I bought some of those Nantes style carrot seeds from the dollar store last year and they were some of the sweetest carrots we ever had. Sometimes a bargain is really a bargain. We’ve been working our way through our freezer the last couple of months. Makes for some interesting meals. 2 years ago, I did an experiment with some of the Dollar store seeds and I really feel like some of them are really good. I also felt like there were a couple that weren’t. I love experimenting, so I’ll keep trying new ones. I have some tried and true favorites from Territorial, too. In the past, I’ve ordered from Johnny’s Selected seeds and Pinetree Garden Seeds and loved their things, too. This year, I chose to order from only one place, my favorite and the one where I had a gift certificate from, so I didn’t have to pay postage from several. When I start my own seeds, I like certain varieties. So I might do something different when I start that again, in the future. I just posted my book report on a few of the different seed catalogs I have. Thanks for giving me the idea. If you are interested, here is the link. Two you might be interested in is Bountiful Gardens (winter seeds) and Adaptive Seeds (for your area of the country). Or you can check them all out online by clicking the title of each one and it will link to their pages. Thanks! I love seed catalogs. I had a much bigger garden area at our old place. I am trying to not buy too many seeds this year, but it’s sure hard–the pictures are so tempting. I think I have a good list, now, but I’ve sure worked on it for a good long time to keep it smaller, but still get enough. Normally, I have some left over from the year before, but last year we used up my stash, which is good. I loved your seed catalog review. I left you a long comment and the computer ate it! I may try again later when I get time again. Thanks for your work on that post. I checked just in case and your message did not make it. I do the same thing then can’t remember what I just wrote! I, too, have had to down scale my garden plans in recent years. In my area, I use West Coast Seeds. They were part of or related to Territorial Seeds at one point in time. So some of the seeds are the same. I can get Territorial Seeds here but it’s an additional mailing charge to mail to Canada so I haven’t used them in years. About the kale, I’ve used my dehydrator to dry it with great success. I then crumble it into a canning jar. I used the ‘powder’ in smoothies. No one seemed to notice when I did it and had teens in the house. Rob, especially, does not like kale in any way, shape or form. That being said, since Lovana does, I’m growing it for her. Maybe I’ll try some new things with it, and get healthy (and get the whole family some vitamins in the process). Hiding it in a smoothie might work. We’ve tried the dried kale “chips” with no success, although friends love it that way. I’ve tried the kale chips a few times and know for sure I don’t like them that way! Dried and then made into a powder and then added to a smoothie, kale is manageable. I also found that I like the curly kind of kale the best but not some other kinds. If I catch it ‘young’ enough, I use it in recipes as a substitute for spinach. For some reason, kale and chard grow really well for me but I can’t grow spinach to save myself. I talked with a friend today and she’s off to plant peas today. I think it’s a little early but might throw a few in the ground tomorrow–‘what the heck’, might as well try a mini row. She always excels with her garden so I think I’ll dig in the dirt on Tuesday. Cheers. I think the package I got is the curly kind. So, maybe it will be awesome! My ground is so wet. I did get 4 primroses planted in a little brick planter box by the front door, but doubt I can do anything in the big garden. I’m sure getting eager. I sent off for the seeds yesterday, so maybe the ground will be drier by the time they come. I know peas could be planted here, now, but we are further south than you are. In the past, if I plant super early, the slugs just eat stuff up anyway…..or it just sits there without growing much until it warms up a bit. I know boc choi doesn’t like long days, and bolts when the days get longer, so I like to plant it early. I’m thinking March for some of the cool weather crops, if I can get in the garden. That’s so interesting! I have never seen yellow beans at our dollar stores around here, but have marvelous success with the cucumbers! Funny! Proud you have had a productive good week.. I too buy some of the seed from the dollar store.. I have had good luck with them..